Ruthiebear (Titusville, NJ, United States) on 30 March 2014 in Animal & Insect and Portfolio. Gorgeous photo of this gorgeous animal. Great colours and light. Deux lions dans mes favoris ce matin... celui-ci n'a pas l'air dépressif...j'adore les couleurs et il a un air plutôt réjoui, ce qui est rare chez les lions ...vraiment superbe ! ***** bon dimanche Ruthie ! Quel beau lion et pelage quelle vue et image sueprbe compo. Lion King! Wonderful animal nicely framed! Good photo job! Very nice light and superb composition, the colors are beautiful. Lion, one of my favorite animals. An excellent picture. Fantastic close up!!! Beautiful details here !!!! such beautiful focus, details, colors & lighting! Great capture of the king of beasts. I like its mild-looking expression. Nice framing and colors. nice kitty! looks like a good place for road trip! 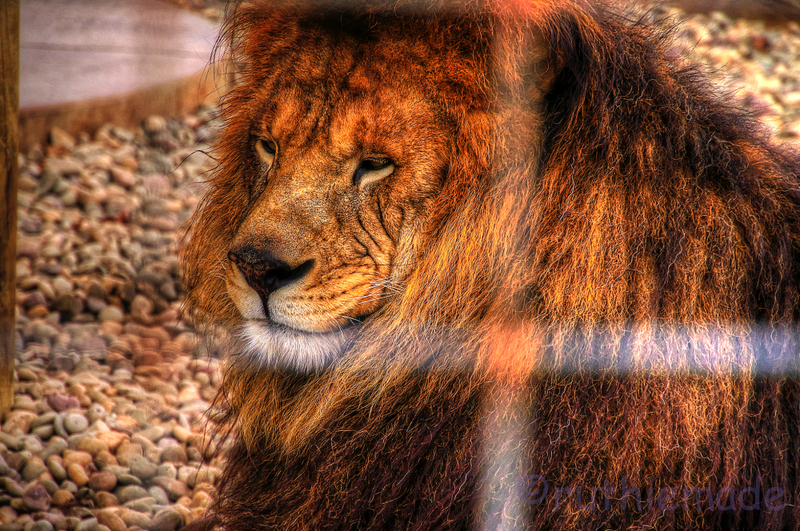 A fine shot of the lion head with the prisoning bars of his place to live. Nice one. Fantastic close-up capture. It's a so powerful image. Gorgeous portrait, great close up, wonderful shot ! Beautiful portrait of this great animal. Wonderful close view! Great capture! Un magnifique animal, malheureusement auquel nous rendons l'existence bien difficile. Beau portrait malgré le grillage. I want to wish the best day to you, Your Majesty. You are really handsome. Gorgeous light and color! He looks so majestic and regal! A fabulous image! Details are great . I am going to coddle him ! Beautiful and so to think about looking, gorgeous picture!:-))Haleja. Happy Sunday ,my good friend! Yes we both have lions today - what beautiful hair he has. Nice capture and thank goodness for enclosures strong enough to contain an adult lion. Impressive light in this nice portrait ! He seems rather old, but a lion is always a great and fabulous creature. the king of the jungle!! Wonderful details in his coat! The retail of king of animal is captured nicely! Wow the colors in this are lovely, such an improvement from the last shot!! Love the detail in his face, you are very good at capturing all the little things that make a shot great!! Well done!! What a beautiful mane of hair he has. So beautiful with that light, Ruthie. Great shot of the lion's head. That is such a beautiful beast. Nicely shot. Great shot of this lion, the details are wonderful. Very well caught with excellent image quality and attitude. great shot, I love the white cross of the cage. He is a handsome dude.